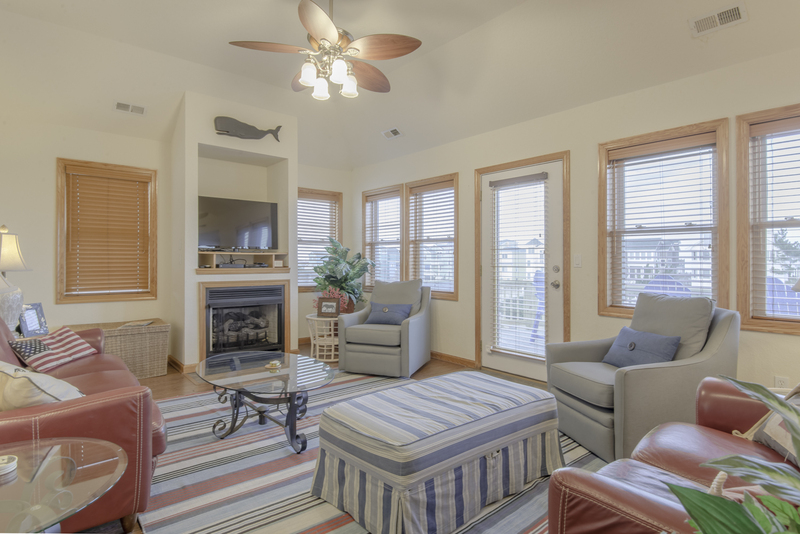 This outstanding Nags Head vacation home is close to the Beach & has its own Deeded Ocean Access located just 70 feet away across the Beach Road. Equipped w/ all the extras for your vacation pleasure, this home is beautifully decorated & offers Ocean Views, a 12x28 Private Swimming Pool, Hot Tub, & Rec. Room w/Pool Table. There are three spacious levels for your family to enjoy & the mid-level den w/TV/Stereo & gas fireplace provides extra living space so the adults & kids can all spread out. The Nags Head Fishing Pier is only a block away & the home is convenient to several area restaurants & shops. This home offers the perfect combination of amenities, views & beach access. Ground Level: Parking for 4 Cars, Entry to Home, Rec. Room w/Pool Table, & TV, Stereo w/CD, 1 Bedroom w/Queen & Bonus Room w/Duo Bunk w/Trundle, Full Bath, & Access to Patio Area w/Gas Grill & Enclosed Outside Shower, & Private Swimming Pool. Mid Level: 3 Bedrooms (Master Suite w/King, TV, & Full Bath w/Jacuzzi; 1 w/Queen, & 1 w/Duo Bunk w/Trundle), Full Bath, Den w/TV, VCR, DVD, Wet Bar w/Mini-Refrigerator, Queen Sleep Sofa, Gas Fireplace, Laundry Area, Covered Deck w/Porch Swing, & Sun Deck w/Hot Tub. Top Level: Living/Dining/Kitchen Areas, Ocean Views, TV, VCR, DVD, Gas Fireplace, Master Suite w/King, TV, & Full Bath, & Sun Deck. Features include: C/AC & Heat, Washer/Dryer, Microwave, Dishwasher, Phone, 6 CATVs, VCRs, DVDs, Wireless Internet, & Deck & Pool Furniture. No Pets. This is a Non-Smoking Unit. Our family had a wonderful week at the Lazy Pelican. The house was equipped with everything we needed for the week. We really enjoyed the good size pool and the hot tub. It was great to be able to walk across the street to the access to the beach. We would definitely rent this house again! IT was beautifully decorated and maintained. Very family friendly. Loved the trundle beds under the bunk beds. It was perfect for my daughter who was too nervous to sleep on the top bunk! The house was in great location and very nicely decorated. It was the perfect size for the amount of people in our party. This is a beautifully maintained house that we will most likely rent again next year. We would definitely recommended The Lazy Pelican to our friends! 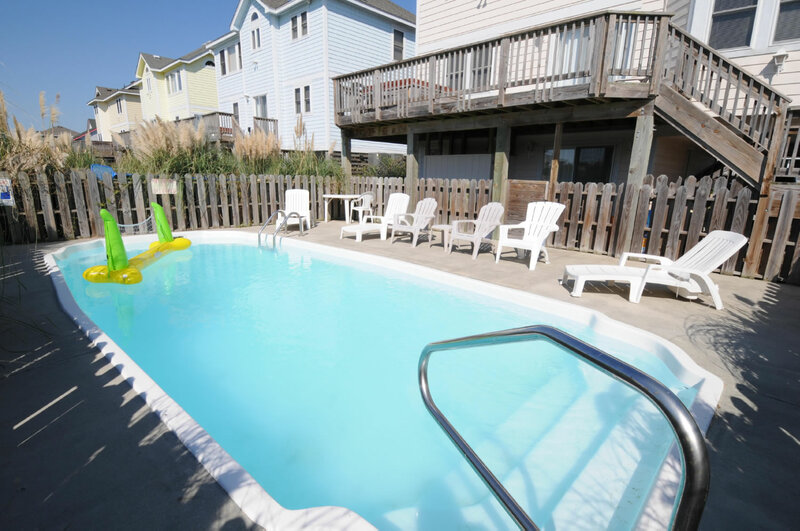 We loved how close the house was to the beach and having the pool, hot tub, and pool table at the house was wonderful!